A woman received an early-morning surprise this week at her home in Santiago, Chile. Amalin Haddad was making breakfast in her kitchen when she heard a noise that she thought was a dog. Instead, she looked over to find a peeping puma -- also known as a cougar -- eating her blinds. "I was making breakfast and all of a sudden," Haddad said. "I thought it was a dog because I saw its legs first, but it was a puma. A puma, a puma like those you see in the zoo." Haddad's son ran to help his mother, but the two-year-old puma didn't seem interested in attacking them. Wildlife officers were called, and the animal was tranquilized and removed from the kitchen. 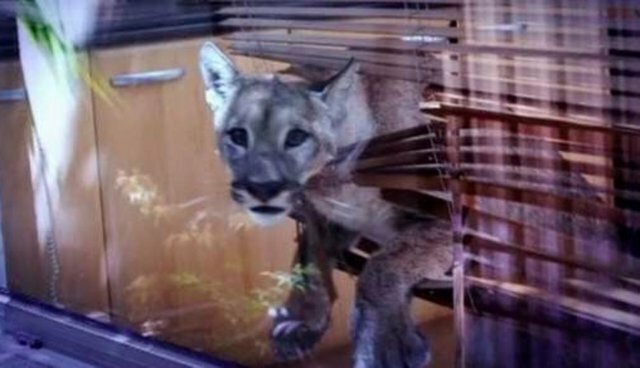 The puma was taken to Chile's National Zoo to be treated for minor injuries.